Faith and Crafts Volume 3 "Five generations of mirror makers: Yamamoto Metal Works from the Meiji era to today"
Handiwork born from prayers to the divine is the essence of craft. Every shape and design on objects associated with faith has meaning. 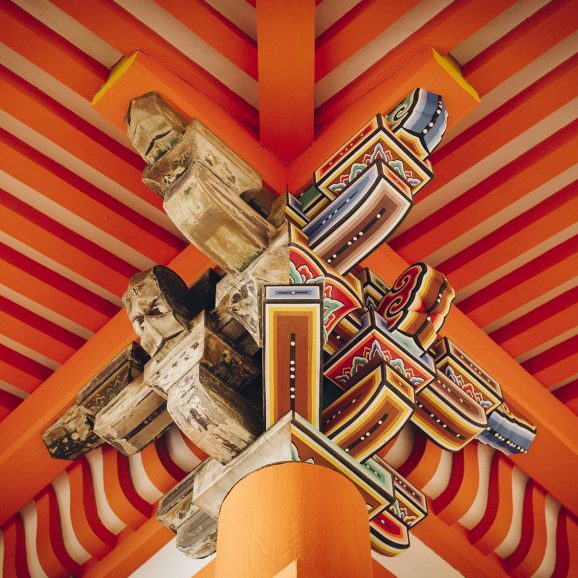 We see the tradition and future of handiwork in the religious crafts of Kyoto passed down for over a millennium and in the work of the craftsmen. In ancient times, bronze mirrors had close ties to religious ritual. Since they were brought to Japan from the continent in the Yayoi period (300 BC – 300 AD), they played a special role as a host to the gods. The design on the back of the mirror is first drawn on paper, and then applied to a mold of sand by pressing with carving tools. The designs featuring sacred beasts or scenes of natural beauty imprinted in the sand are then filled with molten metal, making every press of the fingers critical. The craftsman hesitates, puts his tool down, and then selects another to continue creating the design. Depending on the size of the mirror and complexity of the design, a mold can take several months to create. When the mirror's surface wears thin, the design on the back of the mirror can sometimes appear faintly in its reflected light. This is called the "magic mirror phenomenon." 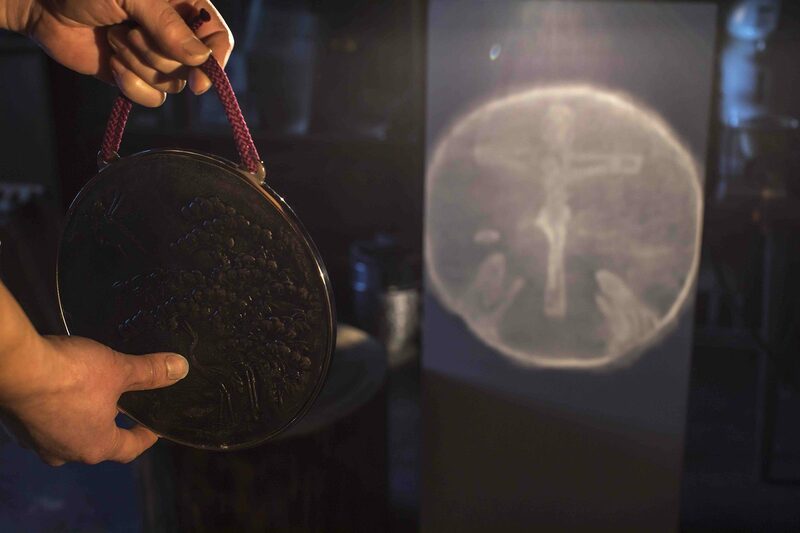 During the Edo period (1603 – 1868), Christians practiced their prohibited faith in secret with Christian magic mirrors—outwardly normal-looking mirrors that would reflect images of Christ or the Virgin Mary. Yamamoto Metal Works alone has passed down the secret to their production to its fifth generation in the modern day. Akihisa Yamamoto: Born in 1975. Joined the family business after graduating from university. As part of Yamamoto Metal Works, the only producer of handcrafted Japanese mirrors, sacred mirrors, and magic mirrors in Japan, he is involved in the production of mirrors for Shinto shrines used as sacred hosts or offerings, the restoration of mirrors in museum collections, and more. The last mirror maker—this phrase is appearing more often in introductions of Akihisa Yamamoto, the fifth generation of Yamamoto Metal Works, the only producer of handcrafted Japanese mirrors. As his father Fujio is still an active mirror maker the moniker is not exactly accurate, but they are rare nonetheless. The family began its business in 1866 at the end of the Edo period, when Japanese mirrors were still an indispensable part of daily life. Since then, the family of mirror makers has continued making mirrors by hand through 151 years of upheaval and change. Once a bronze mirror is cast, it is ground and polished repeatedly. Much of a mirror maker’s work is done while sitting cross-legged. Yamamoto Metal Works was founded in 1866, in the final years of the Edo period. Ishimatsu Yamamoto, the first generation, trained at the Kanamori family’s renowned mirror studio in Kyoto before striking out on his own. Armed with the traditional techniques of Kyoto, he joined the dozens of other mirror makers that were in Kyoto at the time. It was a time when Japanese mirrors were still an indispensable part of everyday life. In addition to the creation of new mirrors, polishing old, cloudy mirrors was a significant portion of a mirror maker’s work. Some craftsmen specialized in visiting households to polish old mirrors, an indication of the close relationship mirrors had with daily life. But partway through the Meiji era (1868 – 1912), more and more mirror makers began going out of business due to the rapid spread of glass mirror. 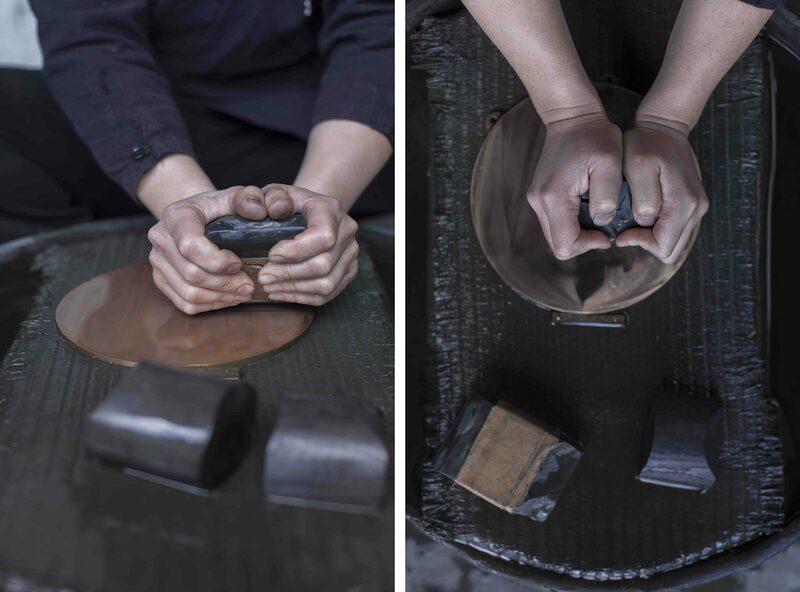 Renowned studios such as the Kanamori family and the Ao family known for providing mirrors to the Imperial palace shut their doors, and when the Showa era (1926 – 1989) arrived the Yamamoto family was the only remaining mirror maker in the city of Kyoto. Shinichi, son of the founder Ishimatsu, took over as the second generation and had become known nationwide as a mirror maker of Kyoto. Shinji (Ouryu) joined the family business as the third generation in 1934. 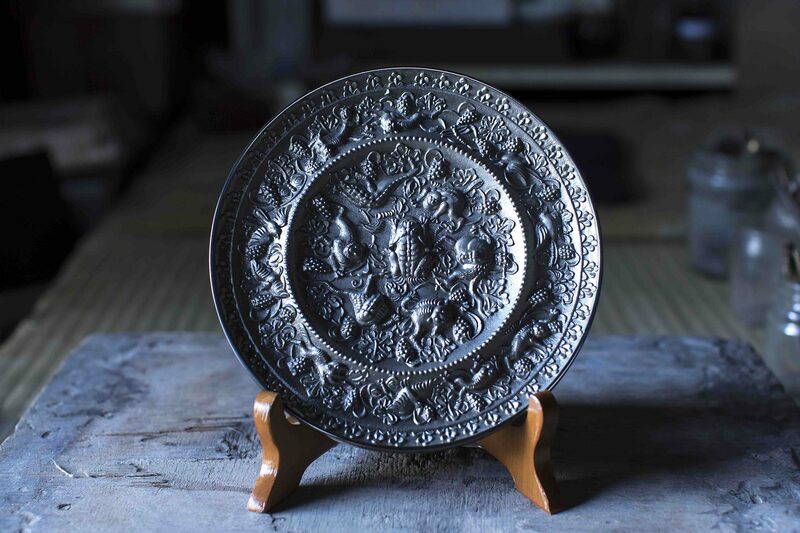 The Yamamoto family primarily produced sacred mirrors to be used as hosts for the gods of Shinto shrines and would singlehandedly meet the demand for sacred mirrors for shrines dedicated to the war dead, built around the country during the height of state-sponsored Shintoism. Amid a hectic schedule, Shinji and his father created mirrors of a wide variety of sizes and designs. The refined techniques that would later make Shinji the first mirror maker named an Intangible Cultural Property were likely developed during this time. Polishing with whetstones, magnolia charcoal, and paulownia charcoal gradually changes rough metal into a mirror surface. Shinji, the third generation, found the method to create Christian magic mirrors in 1974. It was the year before the birth of Akihisa, who would later become the fifth generation. The term “magic mirror” refers to a mirror that projects the design applied to its back in its reflected light. In ancient China, mirrors with such properties were highly valued, known as touguangjing (“light-penetration mirrors”). In Japan, they begin appearing in historical documents around the middle of the Edo period. In particular, the Christian magic mirrors used by Christians who endured persecution for their forbidden faith during the Edo period are well known. They are normal mirrors at first glance, but in a strong light they project images such as Mary or Jesus in the reflection, making them ideal everyday items that could be used for hidden worship. While there were surviving examples of magic mirrors, how they work remained a mystery and they were the focus of research by many scholars. Edward S. Morse and John Perry, educators brought to Japan by the Meiji government, introduced the mirrors’ mysterious appeal to their home countries. The Japanese name for the magic mirrors is a direct translation of the English term “magic mirror” used in Western academic journals of the time. When metal mirrors wear down from repeated grinding and polishing, they can sometimes project the design on the back. Far before the name “magic mirror” was coined, old, re-polished mirrors could sometimes display the magic mirror phenomenon. These chance occurrences were often seen as divine in nature, but there must have been mirror makers who grasped the principle behind it to create magic mirrors intentionally. The Christian magic mirrors are one example of obviously intentional creations. 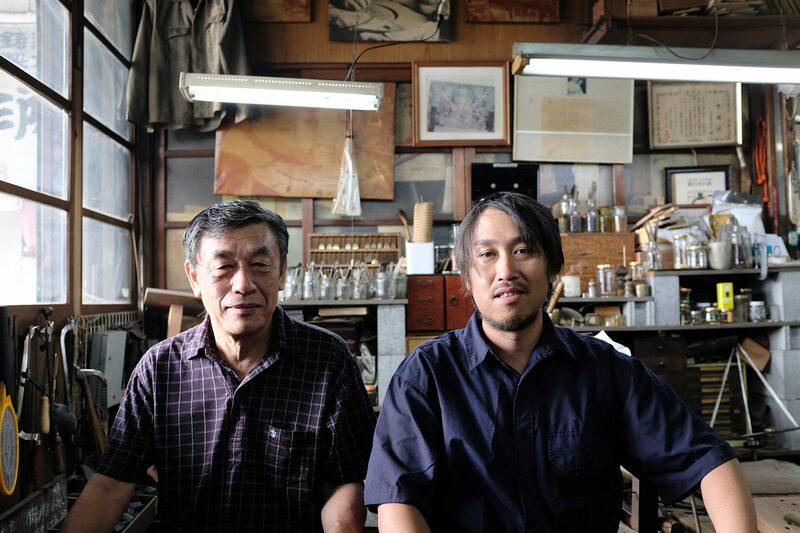 Unlike many Kyoto craftsmen, Akihisa grew up without any involvement in the family business. The home and studio were separate, and his father didn’t talk about work at home. 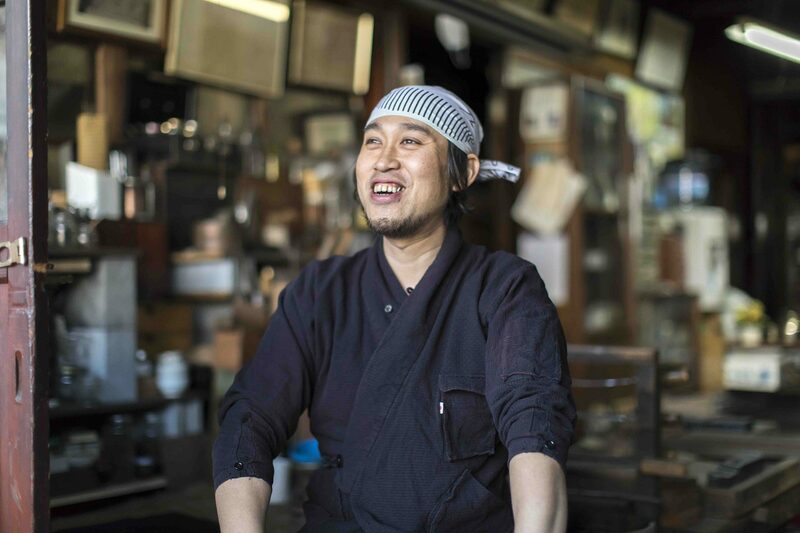 He began helping with his father’s work to earn some spending money after his father offered him 50 yen more than his previous part-time job, but that gradually led to genuine enjoyment. Five years after he began working in the family business, his grandfather started him on learning to make mirrors. 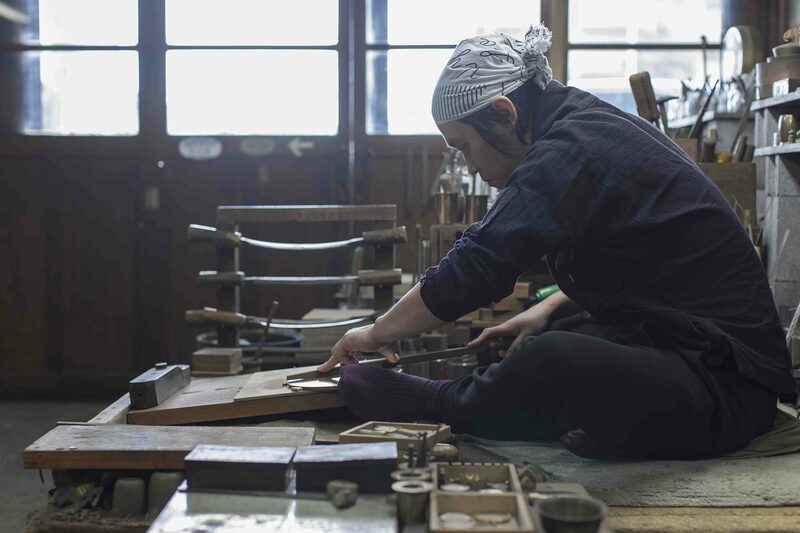 His training to become the fifth generation of Yamamoto Metal Works mirror makers began. His great-uncle Hachiro was a particularly big influence on Akihisa. Hachiro was both younger brother to Shinji, the third generation, and a craftsman who had supported his brother for years. Hachiro worked closely with Akihisa to teach him, and Shinji provided instruction on the key points. Akihisa’s father, Fujio, watched over the training. Through the distinct teaching styles of the three mirror makers, Akihisa absorbed knowledge and skills quickly. (left) Over 200 different carving tools are used to form designs in the sand mold for the back of the mirror. (right) There are many metal files of differing roughness used to grind a mirror after it is cast. “Just blindly continuing to hand-craft mirrors is meaningless. No matter how traditional it is, there’s no point if there is no demand for it. That’s especially true in this day and age, where Japanese mirrors aren’t necessary for everyday life. 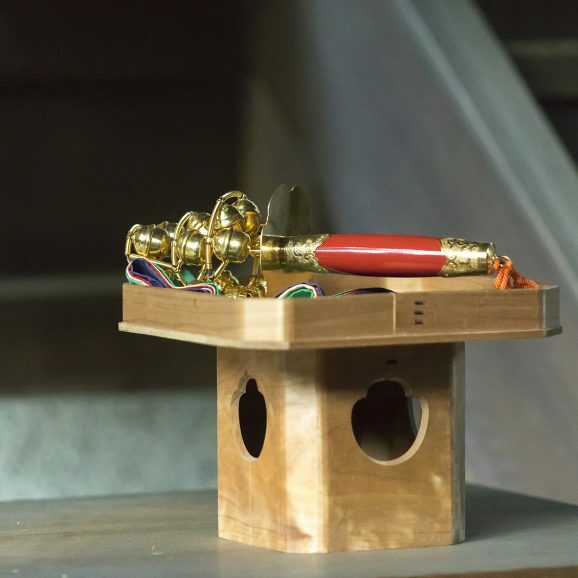 We need to find a way to use the techniques of handcrafting to give back to society,” says Akihisa. He says he thinks about the meaning of continuing with handcrafting and the meaning of working as a craftsman just as much as he works on improving his skills. 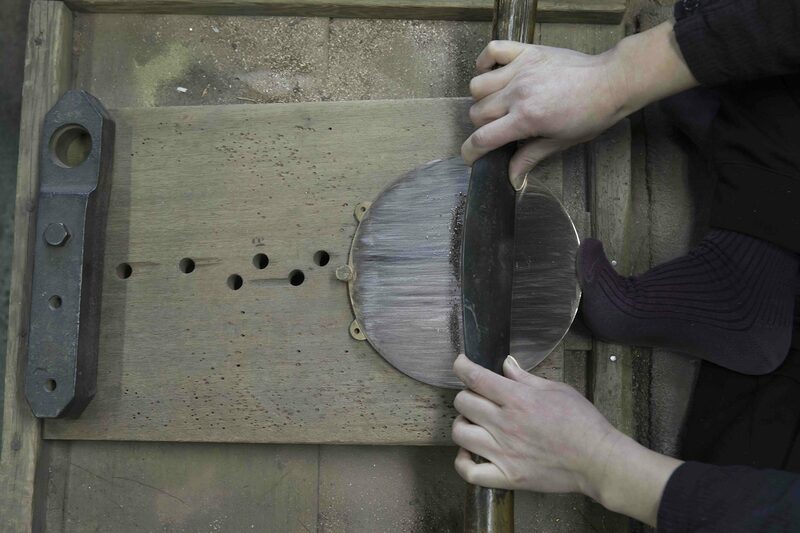 A steel tool called “sen” with handles on both sides is used to grind the mirror’s surface. A mirror decorated with sea creatures and grape vines, known as “kaiju budo kyo.” Many were made in China during the Sui and Tang dynasties and brought to Japan. Yamamoto Metal Works produces replicas of items from museum collections as well. Once handicraft skills are lost to mechanization, it is difficult to relearn them. Akihisa’s statement that handicrafts are his reason for existence shows the pride of the fifth generation of mirror makers. 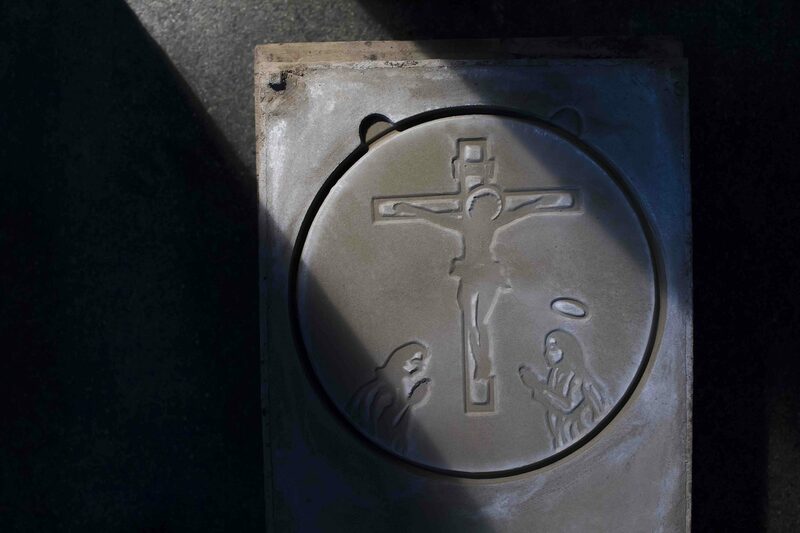 The sand mold for a Christian magic mirror. 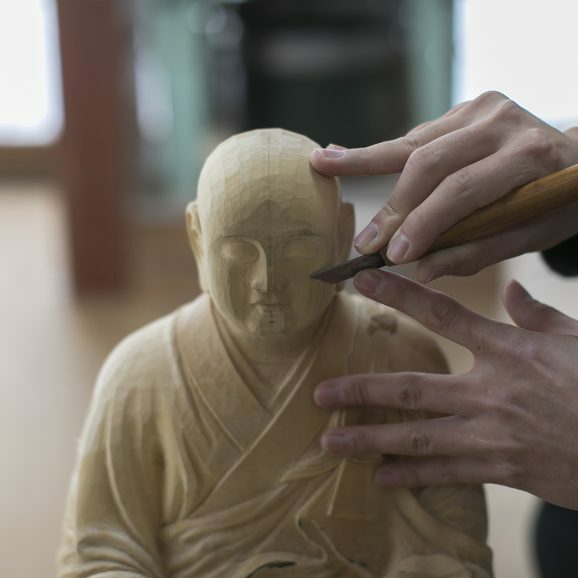 A sand mold can only be used for one cast, so it is created by pressing with carving tools each time.